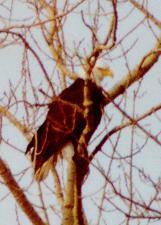 The Bald Eagle at the top of the page was taken March 13, 1997 at Montezuma NWR. I managed to get pictures of two rare (in Rochester) migrants that visited this spring, summer tanager and worm-eating warbler. The tanager visited a feeder in Irondequoit for several days. Unfortunately, the day was quite overcast, and the motion of tanager made the tanager photos a bit blurry (slides taken a few minutes later came out much better!). Worm-eating warblers are a bit more common here, with one or two being seen in most years. This year, one showed up on top of Cobb's Hill. on Sunday, May 11. These include a Bobolink and Chipping Sparrow from the Nations Road area in June 1997, a singing Prothonotary Warbler from Montezuma NWR. (one of a pair that nested there), and a Chestnut-sided Warbler from spring migration. I have two more sets of bird photos from NY. Set #2, includes snow geese, mute swans, great blue heron, green-winged teal, black-throated blue and palm warblers, and black-capped chickadees. Set #3 focuses on gulls, with a Saw-whet as a bonus.